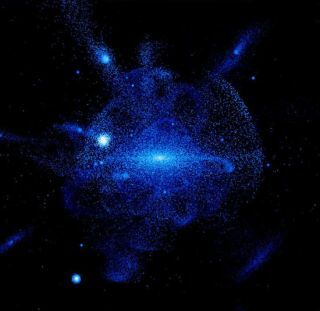 A theoretical model of a galaxy like the Milky Way, showing trails of stars torn from disrupted satellite galaxies that have merged with the central galaxy. The structures seen in the SDSS-II star maps support this prediction of a complicated outer Milky Way. The region shown is about one million light years on a side; the sun is just 25,000 light years from the center of the Milky Way and would appear close to the center of this picture. A new mapof the halo of stars that surrounds our Milky Way Galaxy has revealed acomplicated structure of crisscrossing stellar streams, many of which have neverbeen detected before. While thebulk of our galaxy's stars are concentrated in a fairly flat disk and a bulbouscentral region, the halo is the first thing an intergalactic traveler wouldencounter upon approachingour home galaxy. The halo begins at the edge of the disk around 65,000light years from the galactic center and may extend out as far as 300,000 lightyears from the center of the galaxy. The halo comprises star clusters, cloudsof gas, dark matter, and a few lone stars. Some of these pieces were grabbed upby the Milky Way from dwarf galaxies as they passed by. The largeststellar streams in the halo have been mapped out over the last decade, but newdata from the Sloan Digital Sky Survey (SDSS-II) has found many previouslyunknown smaller streams, remnants of dwarf galaxies that strayed too close anda few surviving companions. The streamsare remnants of smaller galaxies that have been consumed. The newfindings are being presented today at an international symposium in Chicago. The surveymeasured the motions of nearly a quarter million stars in selected areas of thesky, looking for groups traveling at the same velocity. The search turned up 14distinct structures, 11 of which had never before been seen. Because thesurvey has only looked at a small fraction of the Milky Way, the 14 streams found"implies a huge number when we extrapolate out to the rest of the MilkyWay," said Kevin Schlaufman, a graduate student at the University of California at Santa Cruz. There couldbe close to 1,000 streams in the inner 75,000 light years of the Milky Way,Schlaufman said, assuming each of the 14 structures they observed is a separatestream. There is the possibility that there are actually fewer stream that aresimply seen many times in different places. Columbia University researcher Kathryn Johnstondescribes the halo as "a jumble of pasta." "Inthe center of the galaxy, these stellar strands crowd together and you just seea smooth mix of stars," she said. "But as you look further away youcan start to pick out individual strands, as well as features more akin topasta shells that come from dwarfs that were on more elongated orbits." Dwarfgalaxies that pass close to the Milky Way can be stretched by gravitationaltides into spaghetti-like strands, which wind around the galaxy as stars traceout the same orbital paths at different rates, Johnston said. HeidiNewberg, of Rensselaer Polytechnic Institute, and her graduate student NathanCole have been trying to follow some of these strands as they wind their wayaround the galaxy. "It'sa big challenge to piece things together," said Cole, "because thestream from one dwarf galaxy can wrap around the [Milky Way] and pass throughstreams of stars ripped from other dwarf galaxies." Newberg andCole found at least two superposed structures, possibly three or more, towardthe constellation Virgo where SDSS images revealed an excess of stars coveringa huge area of sky. Velocity measurements can be used to separate theoverlapping systems, some of which come from a tidal arm of the Sagittariusdwarf galaxy. The SDSSdata also revealed 14 surviving dwarf companions to the Milky Way, includingtwo new discoveries announced at the symposium. These satellite galaxies areoribiting within the halo of invisible darkmatter whose gravity holds the Milky Way together. The newlydiscovered dwarfs are much fainter than those known before the survey. ThoughSDSS can detect ultra-faint dwarfs, it can only do so if they are nearby, sothere could be several hundred or more further out in the Milky Way's darkhalo. "TheSDSS has taught us a huge amount about the Milky Way and its neighbors,"said Johnston. "But we're still just beginning to map the galaxy in acomprehensive way, and there's a trove of discoveries out there for the nextgeneration of surveys, including the two new Milky Way surveys that will becarried out in SDSS-III."